I welcome you to this platform again. 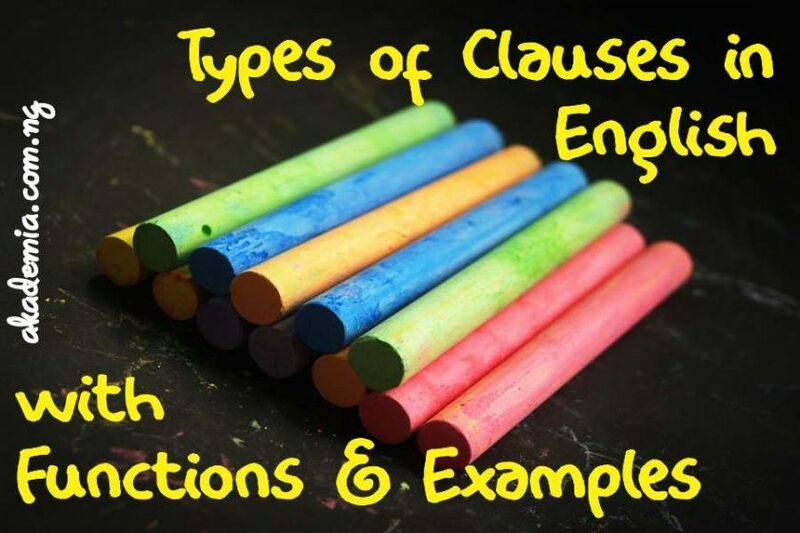 This post gives a synopsis of all the Types of Clauses in English with Functions and Examples. Before we look at the various clause types, let us attempt a definition of the clause. A clause is a major unit of grammar and we define it by the elements it could contain the subject, predicator, complement and the adjunct. A clause is a group of words that includes a subject and a verb and forms a simple sentence or part of non-simple sentence. The finite verb is most central to what constitutes a clause. This a major clause in English. It expresses a complete thought and can stand alone as a sentence. The main clause is also known as an independent or alpha clause. This clause does not depend on another clause to fully express itself. The police rescued several children. The detectives solved the mystery and closed the case. The CIA operative arrested the cartel leaders. I like orange and grapefruit juice. The girl had a heart transplant. Sinbad lost all his possessions. We called the police immediately but the thieves escaped. If a sentence has more than one main clause joined by a coordinating conjunction, we refer to that as either a compound sentence or a multiple sentence. See (Types of Sentences According to Structure). The subordinate clause is one that does not express a complete thought and cannot stand alone as a separate grammatical entity since its meaning depends on the meaning of the main clause. A subordinate clause gives additional information to the main clause. Subordinators or subordinating conjunctions usually introduce the subordinate clause in a sentence (see subordination and coordination). We also refer to the subordinate clause as the dependent or beta clause. When I arrive tomorrow, I will pay the money. If it rains, close all the windows. While reading a novel on the bus, he lost his wallet. Despite sleeping so late the children woke up early. The driver whose car hit a pedestrian has been arrested. Unless the family agrees, the wedding cannot hold. The boy who likes to sleep a lot missed the test. After a participating in a rigorous exercise the team left for the competition. The cell phone which she newly bought has developed a fault. She got angry because her plate broke. A finite clause is that which contains a finite verb. By finite verb, we mean a verb that can be inflected to show tense. (See Types of Verbs). We can also describe a finite verb is that verb which is tied to or dependent on the subject. The boys are parading the streets every night. When the rain sets in, the farmers will start planting. She feeds her baby regularly. We dine out every weekend. The boss treats the staff very well. The student comes to the Chapel every Tuesday. Little children sleep a lot. She eats an apple every morning. Starting a business at old age is quite ambitious. Standing for hours is not healthy. Reading ahead of examination should be a commonplace among students. Taken aback by the incident, he left the scene. Seen by many witnesses, he could not deny any further. Captured by the beauty of the garden, she promised to visit again. To be ready for anything is a sign of maturity. To get involved in trivialities is a waste of time. A noun clause performs the function of a noun in a sentence or functions like the nominal group. Noun clauses stand as indirect or direct objects, nominatives, objects of a preposition, subject of the verb, object of the verb, subject or object complement, prepositional complement, etc. That he will come today is uncertain. Going home at this time is not favourable. Why we came here has not been mentioned. To work hard without compensation is very disappointing. Whoever comes first leaves for the final competition. He did not state what he came to do. We will do whatever our leader says. An adverbial clause is a clause that performs the function of an adverb in a sentence. An adverb modifies the verb in a sentence. It answers the questions: ‘where’, ‘when’, ‘why’, ‘how’, etc. The adverbial clause has different types. These include: Adverbial Clause of time, place, manner, reason, condition, concession, purpose, comparison, etc. While the driver was making a call, the car skidded off the road. When she saw her long lost son, she broke down in tears. He got a gift where he went to teach some students. She vowed to go wherever she would find the materials. Some politicians behave as if they would stay in power forever. The chief boasted as though he had all the resources in the world. The man wakes up early because he has to catch the bus. She had become paranoid since she returned from prison. Provided you sign the papers on time, we might make the trip. The children will not see their father unless wake up very early. He could not see the governor although he had appointment with him. He failed the examination though he studied hard. Check the post dedicated to the Adverbial Clause. This Clause does the work of adjectives and by this, it also has the name, adjectival clause. Adjectives are words that describe or give more information about nouns or pronouns in a sentence. We can divide the relative clause into two categories. There are two types of the relative clause. The first is the Restrictive Relative Clause which we also describe as the Defining Clause or the Qualifying Clause. The second type is the Non-Restrictive Relative Clause which we also call the Non-Defining or the Non-Qualifying clause. We refer to the Restrictive Relative Clause also as adjectival clause because it qualifies the noun in a sentence. This clause helps to define the antecedent such that the referent of the antecedent becomes clear; hence, the name ‘defining clause. What introduces the adjectival clause includes the general pronoun ‘that’ and the relative pronouns such as who, whom, whose, etc. The Non-Restrictive Relative Clause is not an adjectival clause because it neither qualifies nor modifies a noun; rather, it gives more information about the noun in the sentence. The orthographic comma usually marks it off. It answers the question ‘which like the restrictive relative clause’. The meat which he spent so much to buywas already spoilt. The clergy who delivered the fire sermonwas invited by the police. Jane whose bag was stolenhas returned home. The lady I told you aboutis married. The market which is the hub of business activitieshas been closed down. The player, who trained so hard, won the tournament. Six inmates, whose relatives filed a counter order, have been released. The car, that plies the village road, will no longer do so. The match, which fans disrupted, has been cancelled. The grains, which we did not bag, will not leave the factory. Read more about the Relative clause. There are various clause types which students of English and all who desire to be sound in English need to know. This post outlines these clauses with examples. There are dedicated posts on each of these clause types where I provided more details. You can endeavour to check them. Do share these posts; sharing is just a button away; click it below!